There are a number of ways that you can you add videos to your Google site: use a simple hyperlink to an external page that includes the video (e.g. Vimeo), insert a YouTube video, and insert a Google Docs video. Let's take a look at the last two. For example. 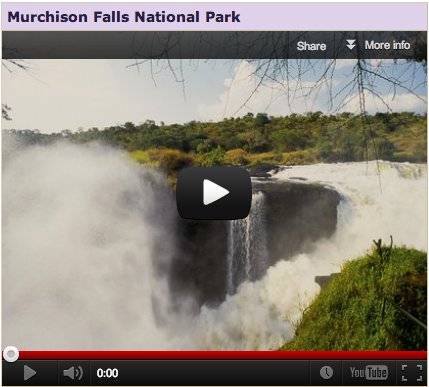 Go to http://youtube.com and type Murchison Falls National Park, Uganda in the Search box. Click on the video thumbnail to open the YouTube page. Copy the web address: http://www.youtube.com/watch?v=NVaPr1zu3lE. 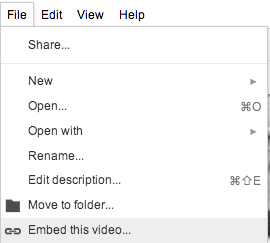 Open your Google Sites page and click where you want to embed the video. Choose Insert > Video > YouTube. Paste the web address into the URL box. Check Include border. Check Include title and enter a descriptive name if you wish to title the video. Click the Save button to insert the video. 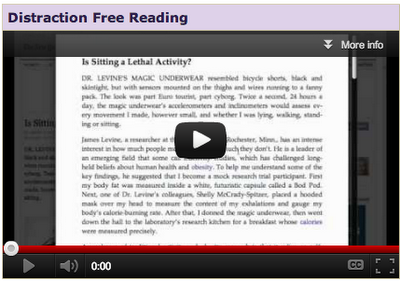 Click to insert the cursor to the right of the video. You should always attribute your source. 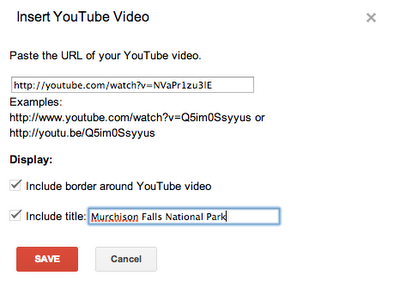 Press the return or enter key and then choose Edit > Paste to insert the originating URL of the YouTube video. You can upload video recordings to your Google Drive and then insert the video into a Google Sites page. For more information refer to Video Files in Google Drive. There are a number of advantages that Google Drive videos have over YouTube. With a Drive quota of up to 30GB it is possible to upload longer videos such as 45 minutes in length, although compressed .mp4 is recommended before uploading. Google Drive sync allows organization of videos in the Google Drive folder on your computer, which are then updated in your Drive share on Google's servers. Videos in Google Drive can be shared with groups and users in your domain when public viewing is not preferred. Log on to Gmail with your Google Apps account. Click the Drive link in the top left menu bar to display the Google Drive home page with a directory of any files you may have. Locate your video file and click the Open button. You will be prompted to Upload your video. Keep the default settings: Convert documents and Confirm settings before each upload. Wait patiently. A video can take several minutes to upload, depending on file size. The upload time for a 15 minute video may take up to 60 minutes depending on Internet bandwidth. It may take several minutes for the uploaded video to render and be available for playing. Click the video to open it into Preview mode. Click the blue Open button in the lower right corner of the screen to display your video (e.g. 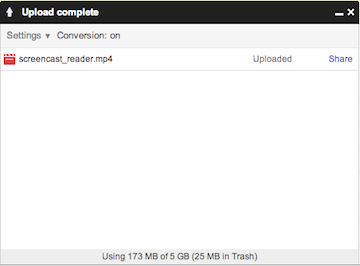 screen_reader.mp4) with the Google Drive player. Click the blue Share button. If you want your Google Drive videos to display on your Google Sites web site for viewing on the Internet, clickChange ... then choose Public on the Web. Use Embed this video to allow playback of your Google Drive videos on mobile devices. Choose File > Embed Video. Click in the box to select the HTML code and then from your browser menu choose Edit > Copy. Click in your Google Sites page where you want the video to display. Choose Insert > More gadgets ... and type embed in the Search box. Select to select the Embed gadget and then click the blue Select button. Click in the Embedding snippet box and from your browser menu choose Edit > Paste. You can edit the width and height but make them proportional to the original. Scroll to the bottom of the gadget window and enter the Width and Height to match the dimensions of your video. 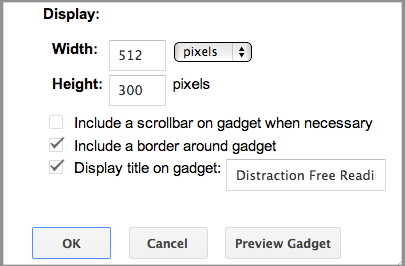 As an option check Include a border around gadget and Display title on gadget, entering a descriptive name. Click the OK button to insert the gadget. You will need to click the Google Sites blue Save button at the top to save the page changes and display the embedded video. Note that this video will also play on mobile devices. Below is a sample video. If your browser is Firefox, Safari, or Firefox, then try Drag and Drop as an alternative to uploading your video to Google Docs. Click the Documents link in the top left menu bar. Locate your video in the Videos folder. Drag your video to your Google Drive window. I would like to create my website online using an authoring tool and than copy or insert the site or pages into Google sites. This looks like a good option but using something like Youtube MP4 works best for me to download videos.